Back in January, I wrote a post about how HART may want to consider looking into re-routing Route 51X to run along the I-4/Selmon Connector, even if the likelihood of such a change was low. Well, in the past couple days, I’ve been made aware of a proposal being worked on for possibly the November, 2014 markup that would change the structure of Route 51X to provide better service to and from New Tampa, as well as southeast Pasco County. The proposal, if approved by the HART Board, would convert the current Route 51X into a Limited Express structure. For those not familiar with HART’s Limted Express routes, these routes are structured as a hybrid between a traditional local route and a traditional express route. A Limited Express route typically has more stops than a traditional express route, but its fare structure is placed within the same category as a traditional local route, thus most customers (including USF Tampa students) can use a Limited Express route at no additional cost, compared to a traditional express route (the local base cash fare is $2.00, where as the express cash fare is $3.00). 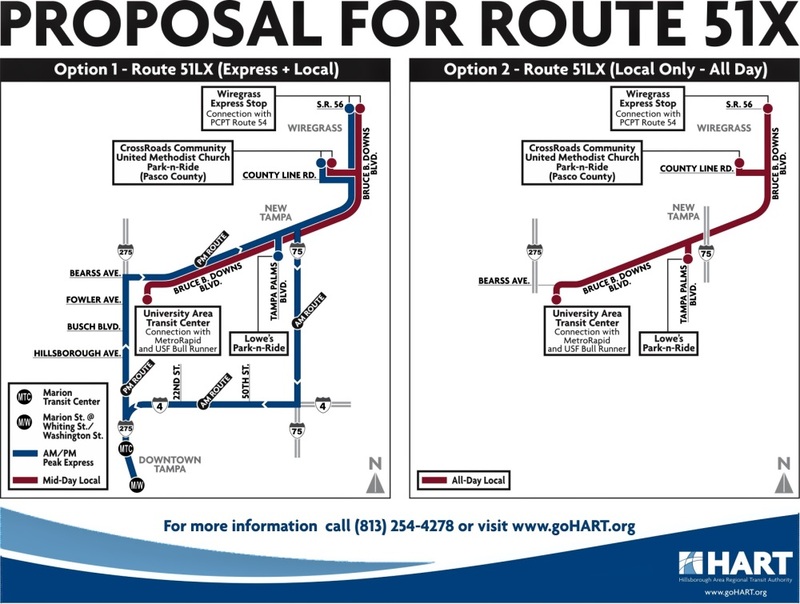 A diagram showing two proposals for Route 51LX. From HART’s Finance and Governance Committee meeting packet (Page 40). Click on the image for a larger look. The diagram depicted above shows two proposals. One would retain the current express trips to and from downtown Tampa, but allow for some form of localized midday service between the University area of Hillsborough County and southeast Pasco County via New Tampa. The second option (right) would eliminate express trips to downtown but retain the localized service depicted on the left. The second option would allow for localized service to run all day, as opposed to only the midday hours. Both options would eventually eliminate the Victorious Life Church Park-N-Ride lot in favor of a Park-N-Ride lot at the Florida Hospital Wesley Chapel campus (the Park-N-Ride lots at Crossroads Community Church and the Lowes on Bruce B. Downs Blvd near I-75 would be maintained), and establish a transfer point at the Shoppes at Wiregrass, where the new 51LX would connect to Pasco County Public Transportation (PCPT) route 54, which provides cross-county transit service within Pasco (it is given the route number of 54 due to it running along State Road 54). Both options would also allow for a stop at the University Area Transit Center, where customers would be able to connect to various local routes and the MetroRapid North-South Line. Whichever proposal is eventually selected and approved by the HART Board, the modified service would allow new riders, particularly those in southeast Pasco County, access to the HART bus system. Many PCPT riders already enjoy seamless transit connections into Pinellas County thanks to the Pinellas Suncoast Transit Authority (PSTA) running local routes into Pasco, and vice versa with PCPT. The modified Route 51 would allow for the same agreement between PCPT and HART, eventually paving the way for a similar modification of Route 20X from Lutz to Tampa, should the modified Route 51 be successful. Some HART riders may recall the failed Route 52LX that ran for a short time during the mid-2000s, between downtown Tampa and New Tampa. That route was operating before the most recent development boom in southeast Pasco was completed (including Wiregrass) and was not able to take full advantage of the potential rider pool that now exists in the area. The modified Route 51 would be able to take advantage of this, and as such, must be executed carefully so that existing ridership is not lost at the expense of trying to bring in new riders. I do want to stress that even though this is great news for New Tampa and southeast Pasco residents, the plan outlined above still has to go before the HART Board for approval. In fact, this proposal is just in the beginning stages, and the board still has to approve the necessary steps (such as outreach efforts) in order to make such route changes a reality (such steps are required by Title VI regulations). Once this proposal is presented to the board, I’ll have a follow-up post as to whether this plan will continue forth or not.